"If you like spicy and hot you will love this. It will make you say 'yum yum'!" In a large saucepan over medium high heat, combine the ground beef, onion and bell peppers. Saute for about 5 minutes, or until beef is browned. Drain excess fat. Add the chili powder, garlic, bay leaf, cumin, chile peppers, tomatoes, tomato sauce and salt and pepper to taste. Bring to a boil and reduce heat to low. Cover and simmer for 1 1/2 hours, stirring occasionally. Stir in the beans and heat through. 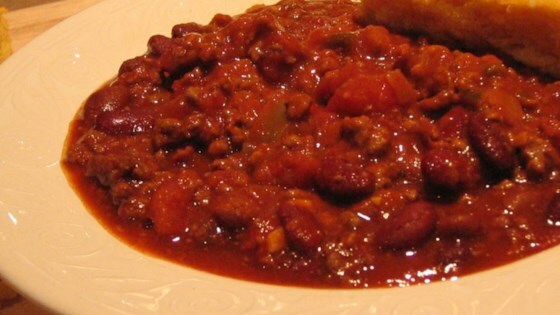 This homemade chili is hearty and meaty, and is very quick to make. I love this chili! I like it thicker and add two cans of tomatoes instead of one, two cans of chili beans and two cans of kidney beans. I do not adjust anything else and it turns out great! Great chili! Try browning the meat in Guiness, it really brings out the flavor in the meat.